Learn the inside scoop on Watergate, the Ford Pardon, and the 18-minute Gap. Roger Stone, The New York Times best-selling author of The Man Who Killed Kennedy: The Case Against LBJ, gives the inside scoop on Nixon’s rise and fall in Watergate in his new book Nixon’s Secrets. Stone charts Nixon’s rise from election to Congress in 1946 to his stinging defeats that preceded the greatest comeback in American Presidential history. "Just as the assassination of JFK prevents a balanced analysis of Kennedy and his times, the myth of Watergate prevents a reappraisal of our 37th President,” said Stone, who’s book on LBJ was the second biggest selling book during the 50th anniversary of Kennedy’s murder. Stone reveals how the Kennedy’s wiretapped Nixon’s hotel room the night before the Nixon-Kennedy debate, and stole Nixon's medical records from his psychiatrist’s office. Stone lays out how Kennedy's running mate Lyndon Johnson stole Texas from JFK through vote fraud while Mayor Richard Daley stole Illinois, and how JFK actually lost the popular vote. Stone looks at the Nixon Presidency: the desegregation of the public schools, the progressive social programs, Nixon's struggle to end the war in Vietnam, the historic SALT arms reduction agreement with Russia, the saving of Israel in the Six Days War, the opening to China, and the disastrous decision to take America off the gold standard. 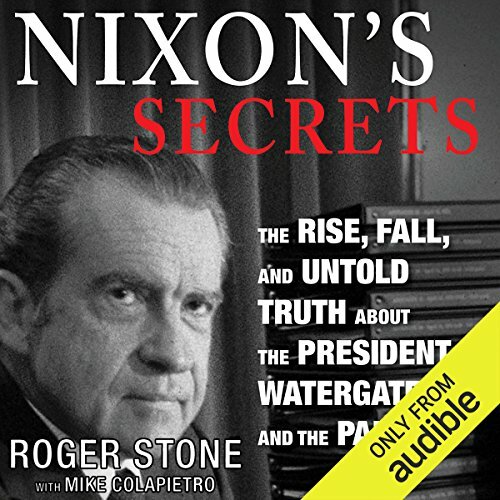 ©2014 Roger Stone and Mike Colapietro (P)2014 Audible Inc.
Would you try another book from Roger Stone and Mike Colapietro and/or Stephen Hoye? Probably not, if I did I would pay careful attention to reviews before buying. Would you ever listen to anything by Roger Stone and Mike Colapietro again? Maybe, but not my first choice. What does Stephen Hoye bring to the story that you wouldn’t experience if you just read the book? The reading was pretty good; however, whether due to writing or narration, it was often difficult to determine when the first person quotes (the longer ones) were attributed to the author or to another source the author was citing. It's unorganized. Assumes event knowledge in the reader that someone my age (mid-40s) might not have. This book was very well written and presented a fair view of President Nixon. It didn't quite elaborate enough on the speculation that lead to watergate in my opinion. I would have liked a little more. The worst part of the book is it is very repetitive. It jumps from 1960 to 1968 back to 1956 over and over again. gave alot of insight to the political climate of the era. a good listen. enjoy! The Untold Truth About Nixon. Brilliant political bio by one of Nixon's personal confidants, author Roger Stone. Learn the secrets of Nixon 's Senatorial career, his relationship as Vice President to Ike, his impeachment following his 49 state reelection landslide. Most compelling is how Nixon negotiated his pardon by threatening to reveal the cover up the Warren Commission investigation for the JFK assassination. loved it, learned alot from this book. The varies political figures discussed here is eye opening. Great source of information about our nation. This book answered a lot of questions for me. It was also very frightening. It was also very believable. Every American should read this. Then quit whining and get involved with our flawed democratic process. We would be a much better country for it. I had to constantly remind myself that it was about how he became the most powerful man on earth. With most stories about Nixon coming from a partisan angle, I appreciate learning history from the angle of someone who was there, and didn't have a political axe to grind. I was really excited to read this after I saw the title. But as they say, never judge right wing propaganda by its cover. I want my audiobook credit back and the author discredited. Perhaps I could hire a plumbers unit to make that happen for me. What a toady. A better written narrative along with a narrator from the 2000's instead of the 1940's. It was too old fashioned and the cadence was too choppy. It is personal taste and I found I did not like the Stephen Hoye narration and that made listening a bit of an effort. A lot of the names, as important as they are were lost on me and I need a brief Who is Who beside me. Hoover certainly had his camera everywhere. This is more action packed than the Wild West. Another great book by Roger Stone with history and cross overs between political families and rivals. Would you listen to Nixon's Secrets again? Why? What other book might you compare Nixon's Secrets to, and why? Which character – as performed by Stephen Hoye – was your favourite?